It seems that after last month they revealed two sketches with the outside of Equus, Hyundai have published today the first draft of the new model. Under the hood the new Equus’ll find a V8 engine of 4.6 liters, later will be introduced a 5.0 liter V8 which will develop about 400 horsepower. 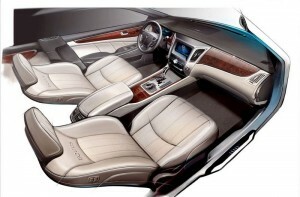 More than that, Hyundai Equus will receive automatic transmission with 8 steps.